Developers need to track the edits (insert, update and delete) while working in any grid control and then provide the capability to utilize the same database connection to perform the updates, and optionally perform the updates as an atomic transaction. There are use cases when a user changes data in a data grid, and those changes are immediately reflected back to the database. Another scenario is one where the design requires that the user be able to make their edits and then commit all the changes at once. An example of this would be a master-detail use case, when child rows are associated with a master record, e.g. customers, orders, order detail. In this example, all other development concerns such as data validation, concurrency, actually reading from or writing to a database are not part of the example code. This, simply, enables the reader to focus on one technique for tracking inserts, updates, and deletes. Though, there are techniques for dynamically adding data to your data source without having to do this, but I wanted to allow C1DataGrid to perform its work in a natural way so our data source is derived from BindingList. 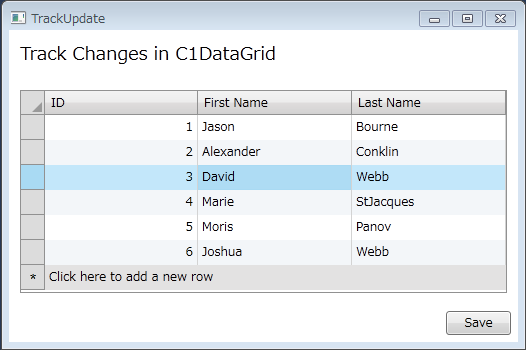 When the user deletes a row in C1DataGrid, the row is removed from the collection and is no longer visible in the UI. This is where our custom class TrackBindingList comes into play. This class keeps track of the deleted rows by adding a deleted row to an internal collection and then exposing a method (GetDeletedItems) to return those deleted rows when required. You may notice I've overridden the RemoveItem() method; the implementation adds the deleted row to the internal collection of deleted rows. It also exposes a method (GetChangedItems) to return only those non-deleted rows that have been inserted or updated. Deleted items are removed from the database. Then the inserted or updated items are committed to the database. The view model would then reload the inserted and changed data into the data grid. This reloading refreshes the timestamps that play the role in concurrency and identity columns are populated after an item is inserted and reloaded from the database.